Nakayama Noriyuki (中山 典之; born September 3, 1932; died February 16, 2010) was a professional 6 dan player affiliated with the Nihon Ki-in, promoted to 7 dan posthumously. Author, reporter and go writer. He wrote over 30 go books, and also ghost wrote books for many top professionals. Nakayama lived in Kamogawa City in Chiba prefecture, Japan. His teacher was Suzuki Goro, and Nakayama also studied with Kajiwara Takeo. Nakayama began playing go with his maternal grandfather in Nagano Prefecture at age 13 (1945) at nine stone handicap. By the end of the summer, Nakayama held white. His strength continued to increase until he was the strongest player in Nagano. He moved to Tokyo to continue his go studies. At age 21, he began studying with Suzuki Goro. Each year he took the professional examination, passing just before his 30th birthday (1962). Since then he has defied the common perception that professionals reach their peak strength early in life. Each decade he has gained a rank, reaching 6-dan in 1992. 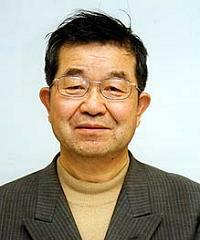 Nakayama was awarded the Okura Prize, for spreading and promotion of go, in 2004 and the Kido Go Promotion Award in 1996. A second edition of his popular book The Treasure Chest Enigma was published by Slate and Shell late in 2005. Additionally, Schaak En Gowinkel Het Paard lists the book as being currently available in English. One of the amazing essays of that book suggests that Nakayama's memorization ability is not really extraordinary for a pro. This book is now also available in German ("Die Schatztruhe" published by Brett und Stein Verlag). His book Magic on the First Line was recently published by Slate and Shell. Nakayama was well known as one of the professionals that most toured the West to spread and teach Go. A delightful person, he was always ready to play amateurs. He was never hard-spoken when confronted with stupid mistakes, but was known to always say something encouraging, like: "Ah! New Joseki, neh?! ", or: "Oohh! Strooong move! But maybe... this (playing his move...) better!!!" At the 2006 US Go Congress, Nakayama announced that he would not be returning next year due to family health considerations (although he was able to return the following year, which was indeed his final US Congress visit). Nakayama taught, lectured and entertained at each US Go Congress. He took part in the European Go Congress 2007 in Villach, Austria. Nakayama was also a frequent guest at the Ischgl Go meetings, which take place every summer in Tirol, Austria, and which combine mountain hiking with Go. Many of us know that Nakayama sensei had a marvelous sense of humor, but he was also a Japanese traditionalist to the core. He had a reverence for Honinbo Dosaku, claiming the latter to be the greatest genius in Go. He wrote the monograph on Dosaku, part of the Nihon Kiin Honinbo series, which has some of the greatest game commentaries I have seen in any Go books. Later, he decided to write a comprehensive collection of all Dosaku games and publish it in the traditional Japanese matted form with a small number of copies. This of course made the collection quite expensive. When I heard of it, I asked if I could buy a set. He said of course and offered me a significant discount, knowing that college professors are not wealthy. An interest twist happened while I was there: a Japanese merchant came and also offered to buy the set. After some discussions, sensei declined and said he was sold out. I was surprised and asked why afterward. Sensei said, the merchant wanted to haggle the price, which is totally inappropriate considering the quality and the significance of the collection; so he would not sell to him. But I did not argue about the price at all, which is the right attitude towards books of such quality; therefore he wanted me to own a set! There is a joke, if jokes can be told at a time like this, that if you are one in a million in China, then there are 1000 people just like you. But there was only one Nakayama. I met Nakayama Sensei at the first US Go Congress in 1985. I can honestly and humbly say we were friends, and he seemed as delighted to see me each year at the Congress, as I was to see him. 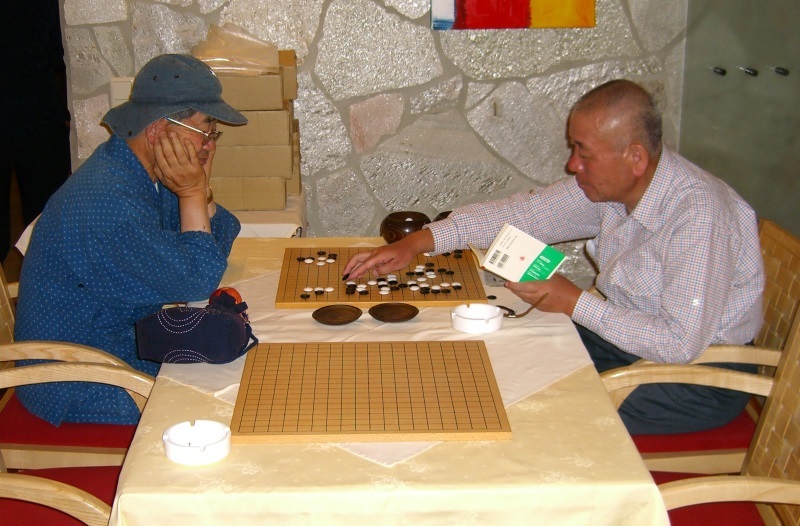 I am not sure this says much about me, but it does speak of Sensei's love for go, love for go players, and, more specifically, his appreciation of those who love the game. In North Carolina, in what was to be his last Congress, although he managed to return, I recieved a great honor. On Friday night, with the week ending, Sensei sought me out to play a game. Not a 10 on 1 simul, or a 3 on 1 teaching game, but a special treat, a one on one game in a corner of the playing room. With a dead palm pilot I cannot recall whether it was 3, or 4 or maybe 5 stones, but I played with determination and yet somehow knowing the result was beyond my control, and was as predictable as Sensei's quiet smile - jigo. His lectures were the best, I particularly loved his game analysis with his wonderful humor. A kyu player makes a strange move and he scratches his head "Hmmm...must be new Joseki". A proud dan player slaps down his attacking move. "Ahhh...Strong move" and with perfect timing he lets the player have his triumphant moment before quietly saying "..but maybe here?" shifting the stone to a clearly devastating spot. He suggests a light shapely move and falters " This is good...what is word?" and someone responds "Sabaki!" And Sensei mocks surprise and says "Oh, same in English". For those who blur the lines between professional and amatuer, who respect only playing strength and not commitment to the game, I submit that it is a shame that you never had a chance to meet Sensei. Of course, he never won a title, and he was no god to worship, he was funny and approachable. But there was an unmistakable quiet dignity that did not ask for, yet clearly demanded respect - respect for a commitment to the game, to teaching and to spreading its joys, winning players with a smile. The go world has lost a great man. I met Mr. Nakayama for the first time in 1984, during his first visit to the USA. He visited our local go club and stayed for two days at my house. A year later I accepted his invitation to visit him in Japan and he and his wife showed warm hospitality during my week-long stay with them at their home in Kuki-shi. I enjoyed sitting around the kotatsu drinking tea, admiring the view of pear trees and grape vines through the window. In his typically generous way, Mr. Nakayama showed me his go world in Japan. Unusual things included a visit to the Dai-Ichi Bank company go club where he taught, a trip to his home area of Nagano, and a display of his personal go equipment including the stones and mulberry bowls his parents gave him when he qualified for pro shodan. I translated for him at the first U.S.go congress up through the tenth. My most vivid memory of him, aside from his generosity to me personally, is of his passion for the game. At the go congresses he was always up for a game no matter how tired he might be. His respect for the game and for people who love it is a lasting lesson for us all. I met Nakayama-San at the 2003 US Go congress in Houston, I was about 15k at the time. I remember his bright smile and animated personality. I recall him telling a story about him sandbagging some cocky player who did not know he was a pro, and actually gave Nakayama-san 9 stones. As I recall, the game went something like. If anyone else remembers this story, please help fill in the details/correct my patchy memory. I always am fascinated by the power of 1st line moves, and so was Nakayama-San. I can still see the smile and chuckle on his face when he showed off his 1st (possibly 2nd, help me out here...anyone?) line tesuji. (MarkD) I had the honor of meeting Nakayama sensei many times during the Ischgl Go meetings, where he was a guest almost every year. During that time I talked to him a lot and in 2005 did an interview with him for the German Go Federation publication DGoZ. Please see below for the full interview. Sorry it was done in german at this time, maybe somebody wants to translate it? During the interview he made a joke about himself drinking 7up. He said "I am 6 dan now, that is why I am drinking 7up, maybe it helps. And if not: You know that at the Nihon kiin players get promoted after their death, so when you read 'Nakayama sensei 7 dan' I have died." When I met him first I had the most hilarious moments of my go career. Early in the morning I was replaying an old game of him in the hotel. I was maybe 13-14 kyu at this time, so I had no clue what I was doing. He recognized the game, sat down and replayed his moves from many years ago while I was replaying his opponent. After some time other japanese amateur players entered the room, saw the sensei and an unkown german player who was winning against the 6 dan pro. Nakayama sensei kept playing, at some point he smiled at me and resigned. You should have seen the faces of the others - priceless. There will be a bhuddist memorial service for Nakayama sensei, the planned date is in July 2010 at one of the places in Austria he very much liked. At this place there is a memorial stone for Nishimura san, a fellow go player and his wife. Nakayama wrote a poem, which is attached to the stone. We are expecting Baba Shigeru 9 dan and several strong japanese amateur players to participate. (MarkD) This interview was done in 2005 in Austria with the kind help of a japanese translator in a mixture of japanese, german and english. Sorry that the full text is still in german, it was planned for the german go federation magazine but was never published there. Wann und wie haben Sie mit Go angefangen? Das erste Mal kam ich im Alter von 5 Jahren mit dem Spiel in Berührung. Bei meinem Großvater mütterlicherseits im Haus war der lokale Treff der Go Spieler, dort habe ich den Erwachsenen immer beim Spiel zugeschaut. Mit einer Stärke von 5 kyu war er damals der schlechteste Spieler im Dorf. Wenn es geregnet hat, habe ich ihn immer besucht und dort bei den Spielen zugeschaut. Eines Tages, ich war 16 Jahre alt und die Sommerferien hatten gerade begonnen, war bei starkem Regen kein anderer Spieler anwesend. Mein Großvater fragte mich ob ich spielen wollte und ich sagte "ja". Er gab mit 9 Vorgabe, wir haben 10 Spiele hintereinander gespielt, das Letzte davon habe ich gewonnen. Mein Großvater war sehr beeindruckt und hat sich gefreut. Am nächsten Tag haben wir wieder gespielt, diesmal mit 8 Vorgabesteinen. Die nächsten Tage wurde die Vorgabe immer weiter reduziert und am Ende der Sommerferien spielten wir gleichauf, ich hatte weiß. Diese Spiele waren die letzten in meinem Leben, bei denen ich eine Vorgabe bekommen habe. Ein Jahr später mit 17 war ich der stärkste Spieler in der Nagano Präfektur. Nach drei Jahren spielen dachte ich "Das ist sehr einfach" und hatte schon das Gefühl, bald so stark zu sein wie Go Seigen. Ich habe damals nicht geahnt, daß es noch 12 Jahre dauern sollte, bis ich auch nur Profi Shodan werden sollten. Wann haben Sie sich entschieden, Pro zu werden? Das Alterslimit für die Profi Prüfung war für die Insei damals 18 Jahre. Nicht Insei bestanden die Prüfung nur selten, das absolute Alterslimit für diese Gruppe war 30 Jahre. Ich war damals 29 Jahre alt, als ich sie bestand. Insgesamt habe ich die Prüfung 9 mal probiert, bis es endlich geklappt hat. Damals habe ich bei Profi Spielen für die Nihon Kiin immer als Spielschreiber die Kifu geschrieben, da ich darin recht gut war hatten sie wohl viel Geduld mit mir. (Er berichtet darüber in seinem Buch "The Treasure Chest Enigma") Mein erstes Profi Spiel war gegen Takenaka Kotaro 4 dan. Nach dem Nigiri erhielt ich weiß und habe das Spiel gewonnen. Was war das aufregendstes Erlebnis in Ihrer Karriere bisher? Das war mein Bestehen der Profi Prüfung und dann wieder die Ernennung zum 5 dan. Ab 5 dan gehört man zur Oberliga der Spieler, man kann sich Gegner aussuchen. Das Vergnügen Go zu spielen ist aber immer dasselbe geblieben. Nicht selten habe ich bei anstrengenden Profi Spielen 2 Kilo abgenommen. Ich war so aufgeregt, daß ich nichts mehr essen konnte. Man kann also sagen, daß das Vergnügen bei Amateur spielen größer ist. Wenn man ein wichtiges Promotionsspiel verliert, war die ganze Mühe bisher oft umsonst. Was würden Sie Amateurspielern als Rat mitgeben, um stärker zu werden? Ein stärkerer Spieler als Lehrer ist sehr wichtig. Wenn man nur für 10 Spiele am Tag Zeit hat, sollte man lieber nur fünf spielen und diese dann hinterher besprechen. Viele Amateur Spieler mögen Tsumego nicht, obwohl diese sehr wichtig sind. Zur Technik der Tsumego kann man sagen: Lieber viele einfachere Probleme lösen als wenige sehr schwere. Für einen Shodan würde ich Probleme so um den 5 Kyu Level empfehlen. Diese sollte er problemlos und fast schon automatisch im Kopf lösen können und dieses Wissen in Spielen anwenden können. Hier sollte man den Sinn der Züge verstehen und nicht einfach nur Sequenzen auswendig abspielen lernen. Auch Bücher können sehr nützlich beim Lernen sein. Wie steht Ihre Familie zum Go? Meine Mutter hat das Go Spiel immer gehaßt und mochte die Idee das ich Profispieler werden wollte absolut nicht. Sie hielt Go für ein Glücksspiel und konnte sich nicht vorstellen, daß man damit seinen Lebensunterhalt bestreiten kann. Ich hingegen halte Go für eine Form der Kunst. Als ich mein erstes Buch veröffentlicht hatte war meine Mutter dann sehr stolz, unter dem Beruf des Autors konnte sie sich etwas vorstellen und sie war damit einverstanden. Nakayama Sensei, vielen Dank für das Interview.